Sorry for the late post – we need holidays too! This nifty pop compilation is the last volume in the original FOTH series published on CD. Don't worry: we have 3 other Internet-only volumes ready to be published when we resume our normal rythm and we will keep up making them. 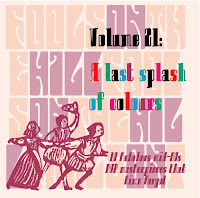 True to Sylvain's POP sensibility, this (not so) last splash of colours features songs that really should have made a dent on the charts… but didn't. No snarling vocals here, but a rather subdued and mellow sound that served as godfather to the future 70's powerpop scene. It also ends with one of my all-time fave "I go to sleep", which showcases how much Chrissie Hind defaced the song when she was given it by her then-husband… hard to beat a Davies! Making these comps does take a while and we will put up another series to fill in the gaps… the incredible Psichodelicias compilations, handwrought way back when email was cutting edge technology, by the same team who brought you FOTH. Psichodelicias is centered on the (then) little-known South-American garage scene, all ripped from original 7". You'll be in for a surprise, even if the savage scene from Peru and the mellow hipsters from Brazil are better known today. It is also under study that we start the Incredible Sound Show series, with a few unknown volumes… Wait and See. Get your little POP masterpieces here. Great collection! Is the band THE END, the same one who put out that 'Introspection' LP? Some information on that JERRY J. NIXON tune would also be appreciated. from his Voodoo Rythm LP.